Familiarity is a distorting prism. All too easily the extraordinary becomes the unremarkable, the aberrant the commonplace. This is what has happened in Britain following the referendum decision to leave the EU. The attempt to wrench the nation out of its own continent has triggered a national nervous breakdown. Only the British cannot see it. If there is a slim hope that Britain can emerge wounded rather than broken, it lies in the possibility that things will get still worse in the short term. Mendacity, chaos and division could end in complete paralysis — with parliament failing to agree on any form of Brexit. If Britain does remain part of the EU after all this, it will be because, in its present state, it is simply incapable of leaving. Self-destruction usually happens in stages. At first there’s a binge in which the thrill outweighs the sense of transgression. This is usually followed by remorse, acknowledgement of risks, and an attempt to reform. But straight-and-narrow is exhausting, and because of this is frequently just temporary, eventually giving way to a kind of capitulation in which the addict drops even the pretense of self-control. 2018 is apparently the year in which the world enters this final stage of its addiction to debt. Wherever you look, leverage is soaring as governments, corporations and individuals just give up and embrace the idea that borrowing is no longer a necessary evil, but simply necessary. (Reuters) – China’s banks extended a record 2.9 trillion yuan ($458.3 billion) in new yuan loans in January, blowing past expectations and nearly five times the previous month as policymakers aim to sustain solid economic growth while reining in debt risks. Corporate loans surged to 1.78 trillion yuan from 243.2 billion yuan in December, while household loans rose to 901.6 billion yuan in January from 329.4 billion yuan in December, according to Reuters calculations based on the central bank data. (CNBC) – Total household debt rose by $193 billion to an all-time high of $13.15 trillion at year-end 2017 from the previous quarter, according to the Federal Reserve Bank of New York’s Center for Microeconomic Data report released Tuesday. (Chicago Tribune) – President Donald Trump unveiled a $4.4 trillion budget plan Monday that envisions steep cuts to America’s social safety net but mounting spending on the military, formally retreating from last year’s promises to balance the federal Budget. The president’s spending outline for the first time acknowledges that the Republican tax overhaul passed last year would add billions to the deficit and not “pay for itself” as Trump and his Republican allies asserted. Trump’s plan sees a 2019 deficit of $984 billion, though White House Budget Director Mick Mulvaney admits $1.2 trillion is more plausible after last week’s congressional budget pact and $90 billion worth of disaster aid is tacked on. That would be more than double the 2019 deficit the administration promised last year. (CNBC) – U.S. government debt yields hit session highs Wednesday after the government reported inflation in January rose more than expected. The yield on the benchmark 10-year Treasury note jumped to 2.882 percent as of 10:03 a.m. ET. It hit a four-year high of 2.902 percent on Monday. The yield on the 30-year bond was last seen higher at 3.146 percent. Bond yields move inversely to their prices. Schwab’s Kathy Jones argued that the latest reading could mean that the yield on the benchmark 10-year note could test 3 percent in the next few months. (Kitco) – Gold prices are posting sharp gains of around $20 an ounce in late-morning action Wednesday. A volatile day in the U.S. stock market is helping to boost safe-haven gold. U.S. stock indexes were poised to open the U.S. day session modestly up, but then dropped sharply in the immediate aftermath of a hotter-than-expected U.S. consumer inflation report. Since then the stock indexes have bounced back above unchanged. Meantime, the U.S. dollar index has lost good early gains to trade lower on the day, and that is also helping out the precious metals market bulls. April gold was last up $21.10 at $1,351.40. A crack-up boom is the crash of the credit and monetary system due to continual credit expansion and price increases that cannot be sustained long-term. Often, banks will attempt to prevent a crack-up boom by halting credit expansion, which ends up backfiring and yielding the same results that the boom would have caused. Both scenarios result in an economic depression when the bubble finally bursts and the economic system crashes. When the economy is down, one way to give it a temporary revival is to feed extra money into the system – AKA economic stimulus. Providing people with credit makes them feel richer and more inclined to spend their money, which in turn feeds more money into the system. When people spend money, they tend to want to continue this trend and continue to buy, despite the fact that their extra cash isn’t coming from actual savings. The problem comes when the government continuously pours more and more money into the system and the actual economy beneath the false expansion cannot keep up. Feeding money into the economy is a quick way to give it a short-term boost, but this practice isn’t sustainable over the long term. If credit expansion continues without limit, prices continue to rise until they reach the point at which the entire system collapses because it can no longer sustain itself. People can no longer afford the high prices, so credit must expand even more to accommodate these prices, which pushes them even higher. What Type of Economy Can Be Hit by a Crack-Up Boom? A crack-up boom is something that can only happen in an economy that relies on paper money rather than the gold standard, or electronic systems of monetary transaction rather than physical. In a gold standard economy, interest rates cap out at around 3 to 6%, since credit is based on actual saved money, instead of being adjustable depending on the circumstances. However, in a system that revolves around paper money, more cash can be printed at any time and introduced into the system. This affects the value of each dollar and affects the prices of market commodities. When the government introduces into the economy money that doesn’t really exist (in the form of false credit) it’s only a matter of time before the economy is damaged, even if the original intention was to boost it. We write these Reports over the weekend. At the time of last week’s writing session, Friday’s close on the S&P was 2757 (futures). Monday this week saw a crash, with the S&P down to 2529 at the low point in the evening. That is a drop of -8.3%. We are not stock prognosticators, and we will neither tell you “short the market” nor “buy the dip”. We have a different point to make. Rising interest rates, by a variety of mechanisms, cause stocks and all asset prices to go down. We have touched on a few in this Report. One is that investors have a choice between the risk-free asset—the Treasury bond—and anything else (note: the Treasury bond is not risk free, but if it defaults then everything else will be wiped out in the collapse). Why would they accept a lower yield on stocks along with the greater risk? Another is that corporations can borrow to buy their own shares. Management may do this if the interest rate is lower than their shares yield. But they can sell shares to pay off debt if the shares have lower yield than the interest rate. Consider home buyers. It is well understood that most people are monthly payment borrowers. That is, they have a budget for the mortgage payment and fit the house to that budget. If the typical middle class family can afford $2,500 a month, that’s it. When the 30-year fixed mortgage rate was 3.4% in 2013, this family could afford to finance $565,000. Today, at 4%, the amount is down to $525,000. Interestingly, the 30-year mortgage rate illustrates our ongoing theme. Demand for credit is soft. In a time when 12-month LIBOR was under 0.8%, the 30-year mortgage rate was 3.4%. Now that LIBOR has risen to 2.3%, a gain of 1.5%, the 30-year mortgage is going for 4%, or only 0.6% higher. If the mortgage had increased by the same 1.5%, it would be 4.9% and this family would be down to financing $472,000. And it gets worse. In a falling rates environment, many people take Adjustable Rate Mortgages (ARMs) with a balloon payment at the end, which is another form of duration mismatch. So the relevant 2013 comparison is not 3.4% but 2.6%. At 2.6%, someone willing to use an ARM—we will call him the marginal home buyer—could finance $625,000. In rising rates environment, we assume that most people will want to fix their mortgage rate. And now there is a consensus, from Fed propagandists to the gold bugs and everyone in between. Everyone thinks that rates are rising. So the relevant comparison for amount financed between 2013 and today is $625,000 to $472,000, a drop of -24%. Let’s move on to the automakers. At least in the US (we don’t know if this occurs in other countries), they are advertising 0% to finance a new car for 72 months. Of course, the carmakers cannot borrow for free. Let’s assume they are playing the duration mismatch game, and using 1-year maturities, because it’s a lower rate. The disadvantage of financing a 6-year loan with a 1-year liability is that you must roll the liability five times, on each anniversary. The advantage is that the rate is lower. Ford sales for the last 12 months are over $150 billion. Even if a quarter of their sales were financed this way, the increase in cost of borrowing over the last three years is $690 million. That covers a year’s worth of sales. But since the company has to carry this debt for up to 6 years, assume annual increase in interest expense is double that (it would be complicated to calculate and we would need more information, but double seems conservative), or $1.38 billion. Rising interest has added costs which are a big in relation to the automakers’ annual profits, Ford makes around $5 billion a year. This situation—rising rates to the car companies, but zero interest to consumers—helps proves our case that we are in a falling-rates regime. A falling rates dynamic has soft demand for credit, which increases only when the interest rate ticks down. And likely in commercial real estate. When a landlord finds a creditworthy tenant who is willing to sign a 5-year lease, the landlord may spend some money building out the space to the tenant’s needs. The cost of this has to be amortized in the rent. How much should the landlord be willing to spend, and how does the landlord calculate amortization? A higher interest rate means it’s harder to subsidize the cost of accommodating the tenant’s needs. But if there is a high vacancy rate, the landlord may be caught between a rock and a hard place. Either don’t do it, leave the space empty, and default on the mortgage. Or do it, add to the monthly debt service burden, and risk default—in hopes of increasing the chance of finding other tenants for the other empty spaces in the building. Now let’s get back to that most people expect rates to rise. Last week, we discussed the causes and effects of the rising cycle (which last occurred 1947-1981) and the present falling cycle since 1981. We said it would take either a miracle or a calamity to reverse and cause a rising cycle. A miracle would be rising productivity and rising profits. A calamity would be rising time preference. And rising rates would cause a calamity—a cascading series of defaults. Let’s look at that. Here is a graph of the M2 money supply and US government debt along with the interest rate on the 10-year Treasury (all data courtesy of the St Louis Fed). For this time period, we see that M2 and debt are highly correlated, and anti-correlated with interest. We have indexed debt and M2 as we are only trying to show the correlation. We went back only to 1981, not because it’s the start of the current falling rates cycle, but because the data does not go back farther. If we had looked 1947 to 1981, we would see debt going from $258 billion to $998 billion, an increase of 287%. At the same time, M2 went from $146 billion to $1.8 trillion (courtesy econdataus.com), or 1,133%. Due to a change in sources in this data set, the change could be overstated by perhaps 400%. The point remains, the rising cycle and the falling cycle both have rising government debt and rising quantity of dollars. That’s just how a centrally banked fiat currency works. It’s a feature, not a bug. But it does not always have rising rates. It can have—and does right now—falling rates. If you think that as of 2018 a new correlation will begin, we encourage you to describe your theory. And please write to us. We would love to look at a new theory. Today, we have a dollarcentric view analogous to the geocentric view of the Medievals. Analogous to retrograde motion of planets, is the question of whether gold or stocks are outperforming. According to the dollarcentric view, the S&P stock index fell from 2,757 to 2,619, or -5% this week. And gold fell from $1,333 to $1,316, or -1.28%. So most people say stocks underperformed. And most gold bugs are excited, because this (supposedly) supports a case that gold is going back into a bull market. For reference, silver fell from $16.56 to $16.32, or -1.45%. So silver underperformed gold. Which would not be supportive of the gold bull market thesis. This should not be a radical idea. Even dollar advocates admit that the dollar goes down—indeed the stated goal of the Fed is 2% decline per annum. And they also admit that there can be long leads and lags, years or decades. So this unit, which is an ever-stretching rubber band subject to unpredictable volatility is supposed to be the unit of measure. And gold, which is not subject to central planning, is just one alternative of many investments—all to be measured in centrally planned rubber bands. Gold standard aside, this revolution is necessary, and we believe that it’s coming. It will have to, as our currency becomes more volatile. Those stuck believing that our gyrating, failing currency is the center, while it goes off the rails, will not be able to grasp what happens. What we look for when analyzing intra-day price moves is the behavior of the price in relation to the basis. Friday’s action is similar to many of our previous intra-day Forensic Analysis, where we see that price and basis move together, in this case both falling. European Central Bank statistics show that wealth distribution in Germany is extremely unequal. But a new analysis by the German Institute for Economic Research shows that the situation is even worse than initially thought. The problem, though, is that it isn't so easy to calculate that distribution. Official data does, of course, exist. In Germany it is compiled by the Federal Statistical Office, and the European Central Bank (ECB) has been doing the same for the eurozone over the last few years. That data shows an extremely unequal wealth distribution. But in reality, wealth is even more concentrated than the data shows, because the statistics have a blind spot: The superrich and their assets are consistently underestimated. This is because, on the one hand, there are so few of them that they aren't adequately accounted for in randomized surveys. On the other hand, the statistics are based on voluntary responses - and willingness to participate demonstrably sinks as wealth among respondents increases. When it comes to the superrich, however, there are relatively reliable estimates in the form of lists of the world's wealthiest people, with the one compiled by the US business magazine Forbes leading the way. A similar list is compiled in Germany by manager magazin. A team of tax experts led by Stefan Bach of the German Institute for Economic Research (DIW) has examined the wealth statistics compiled by the ECB and augmented them with lists identifying the ultrarich. And the team did so for three countries: Germany, France and Spain. By incorporating lists of the wealthiest people in Germany, it becomes clear that wealth inequality is much greater than reflected in the official ECB numbers. According to the DIW study, the wealthiest 5 percent in Germany owned 51.1 percent of the country's entire wealth in 2014. ECB numbers, meanwhile, held that the richest 5 percent only owned 31.5 percent of the nation's wealth that year. Furthermore, the top 1 percent of German households owns a third of the country's wealth (instead of the 23.6 percent shown by ECB statistics), and the top 0.1 percent owns 17.4 percent (instead of 6.3 percent). The richest 0.001 percent - just 400 households - own 4.7 percent of the country's wealth, according to the DIW, which is twice as much as the roughly 20 million households that make up the poorer half of German society. In the graphic, you can also see the absolute amount of wealth each category owns. According to DIW calculations, the poorest half of the population in Spain owns just under 12 percent of the country's total wealth while in France, that number is slightly above 6 percent. In Germany, meanwhile, it is just 2.3 percent. The richest 10 percent of households in France and Spain own less than half of their country's wealth, respectively. In Germany, that bracket owns close to two-thirds of the nation's wealth. That shows that wealth distribution in Germany is much less equal than statistics would seem to indicate - and much less equal than in other large European countries. DIW researcher Bach, though, does suggest that the consequences of inequality in Germany is likely less deleterious than it is elsewhere. His explanation is that the list of German billionaires compiled by manager magazin is largely made up of families that own successful companies, many of them typical representatives of Germany's strong medium-sized company sector. "They are considered the backbone of the German economy. They strengthen competition with large corporations, create jobs all over the country and usually take care of their people and their regions," Bach says. Furthermore, the investments they make often come from their own capital reserves instead of from bank loans. All of that benefits lower income groups. In Germany, in other words, Bach believes it really is the case that the wealth belonging to the superrich also benefits society as a whole. But Bach also sees the extreme concentration of wealth as a problem. Families that own successful companies have a particularly large influence on politics through direct access to the chancellor or state governors and by way of expensive marketing campaigns. The result is that privileges for the wealthy remain significant when it comes to inheritance tax. And Germany doesn't have a wealth tax. I’m typically not one for nostalgia, but doing 10 years of anything (in a row is pretty impressive. I have saved every single issue, in this bookshelf in Christian’s office. 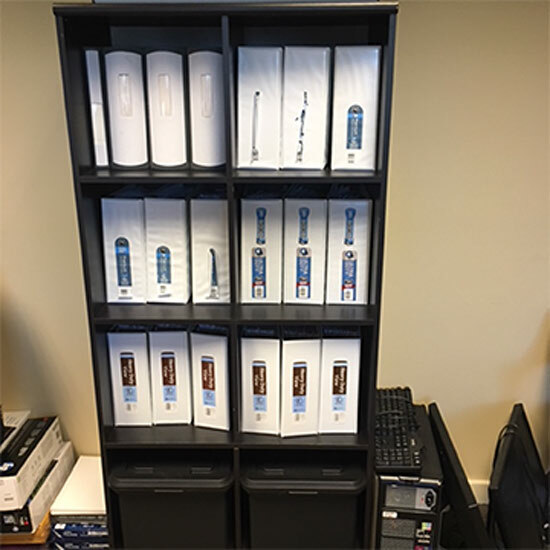 That’s what 9 years of writing looks like. Anyway, looking ahead to 2018. I hear that we just had a perfect year in the stock market, a year in which the market was up every single month, which apparently has never happened. Hard work being short stocks. What about next year? I wish you all could have been present for my talk at DirtCon, in which I laid out the long term view. The long term view is: Trump is going to be Trump. Again, Axios has the best sources in the White House. Mnuchin managed to keep a lid on Trump during Tax reform, successfully I might add, but Trump is a true believer on trade and he wants his tariffs. We are going to get them imminently. This is the whole reason we are holding letter X. The position is somewhat large, and I am going to make it even larger in 24 hours. But the tariff issue is much bigger than letter X. Let me go out on a limb and say that...tariffs...could hammer the stock market. Nothing seems to hammer the stock market, so who knows, but historically, unfree trade seems to do the trick. And the thing about opening the tariffs Pandora’s box is that people retaliate, and it gets worse and worse and worse. I hate to make sweeping statements, but this could be the beginning of the end of globalization. Now send this process in reverse. Anyway, for people who weren’t there during the conference, I said that Trump was eventually going to be Trump, because cooler heads can only prevail for so long. The volatility that we thought we were going to get from the beginning—we will get. And that is the one thing that I’m more willing to bet on than lower stocks: higher volatility. The other thing that the Axios guys keep hitting on is that the probability of war is a lot higher than we think it is. Wars can be good for stocks, but in this case, probably not, considering that they are priced for perfection, and considering the risks involved. So I’m going to say that war is bad for stocks and tariffs are bad for stocks and the chances are good that we are going to get one or both. I have a gift for oversimplification, so there you have it. I think we are going to have a bad year, and I think that people making fun of pessimistic people is probably going to hit a wall going full speed. This one snuck in over the Christmas break: Uber just did a massive down round, with Softbank, of course. I wonder. What would Uber’s valuation be in a Softbankfree world? A down round from the biggest unicorn is a huge deal, but nobody was paying attention during the Christmas-New Year’s no-zone. If there’s one position I can play, it’s the goalie. As I write, a Bloomberg story just came up (and disappeared...I hate when it does that) about how “Corporate Tax Cut Fever May Spread Around The Globe.” This should be obvious, but isn’t. We are in competition with other countries. To attract investment, other countries, especially in Continental Europe, are going to have to lower corporate tax rates. Macron was lowering France’s, but he is going to have to lower it faster. The U.K. is in the midst of lowering theirs. So I just wrote a bearish article up there ↑ but there is going to be a lot of (lagged) global growth coming out of these tax cuts. I don’t care if you like Trump or not, or whether you think he’s an idiot for talking about the stock market all the time, the stock market went up because he promised tax cuts and delivered. If you start seeing this elsewhere in the world, you might see rising stock markets there as well. Not for nothing, we’re still long a boatload of EWQ, and I said at the time that the French election was a really, really big deal, and that Macron was going to ruthlessly transform/reform the French economy. That’s the whole reason we’re long EWQ. France is going to be ripping for years to come, especially if he gets some giddyup on these corporate tax cuts. On the one hand, tax cuts...on the other hand, tariffs. Going to be an interesting year. For what it’s worth, I’d say that the tax cuts are mostly priced in and the tariffs are not. Is anyone other than me talking about the implications of unfree trade? I don’t think so. Actually, it’s about time we retired the “going postal” phrase. Nobody has gone postal in a post office in a long time. The reputation is no longer deserved. Trump said that the postal service needs to charge Amazon more to deliver packages. Trump is looking a bit lost/befuddled here, but one of these days he is actually going to dream up a legitimate way to go after Amazon, and then it is going to be all over. Is there anyone in the Trump administration who understands antitrust law well enough to make this happen? Are they having conversations with legal scholars and lawyers at the DOJ? If you really dislike Amazon, this is the way to go after them. Trump doesn’t like Amazon, and it’s because Bezos’s paper rips on him 20 times a day. This is going to happen. It is only a matter of time. I have to wonder what goes through Bezos’s head. Your newspaper rips on the president every day. Not smart! Yes, you have 100 billdog, making you the richest person in the world, but the richest person in the world is not more powerful than the president of the United States, who has unlimited legal resources at his disposal. Why poke the tiger? Talk about a giant ego. The trend is your friend. There is resentment building against big tech companies. It has not reached a top! We are not even halfway there. This is a 5-10 year trend; this is only the beginning. 2018 will be the year that we start to see some action. I have no idea what form that will take, but it’s coming. See “BOOLEAN ALGEBRA” from last year. Saw the Winston Churchill movie, was not disappointed. Americans don’t know a lot about Churchill. They don’t know that it’s actually one of history’s great ironies that he became prime minister so late in life—really, most of his best work had already been done. Churchill was one of the world’s most prolific writers, mostly by dictation. The man was a fountain of words, writing millions over his lifetime. It took a guy like Churchill to make the case that Hitler could not be negotiated with—when everyone was in the mood to negotiate—even the King. Anyhow, some interesting parallels today with North Korea. North Korea isn’t marching across Asia annexing territory, but you could make the same argument that Kim Jong-Un is not someone you can negotiate with. He is as irrational as Hitler. Trump may understand this intuitively, but he may be the least articulate leader in our history, and if we learned anything from tax reform, it is that salesmanship counts for a lot. A lot of people think their taxes are going up (when in fact they are going down), and by the way, under Trump we’ve pretty much completely defeated ISIS, but nobody is talking about it. Again, inarticulate, a lack of salesmanship—which is all part of leadership. Saw the movie yesterday at the 1:40 PM showing and the place was packed. Everyone had the same idea. People are getting bulled up on the idea that the Fed might hike more than three times this year. That’s not unreasonable, given that stocks have gone straight up and financial conditions are the easiest they’ve been… ever. 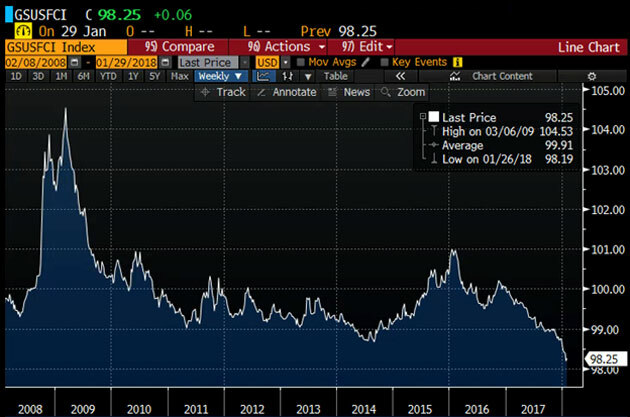 I hereby present a chart of the GS Financial Conditions Index. Note: an increase in the FCI is evidence of a tightening of financial conditions, and a decrease indicates easing. Lots of folks (like me) have been telling the Fed to take away the punchbowl. We have bubbles everywhere and we still have negative real interest rates. Who knows, maybe they will finally listen! But people have a high degree of certainty about the future path of interest rates at a time when they should have the highest degree of uncertainty about the future path of interest rates. Why? Because we have a new Fed Chairman, of course. It is possible that we will have more than three rate hikes this year. It is also possible that we will have less than three rate hikes this year. It is possible that we have zero. It is possible that we have rate cuts. Markets being what they are, I will tell you one thing for sure: I don’t know how many rate hikes we have this year, but it probably won’t be three. 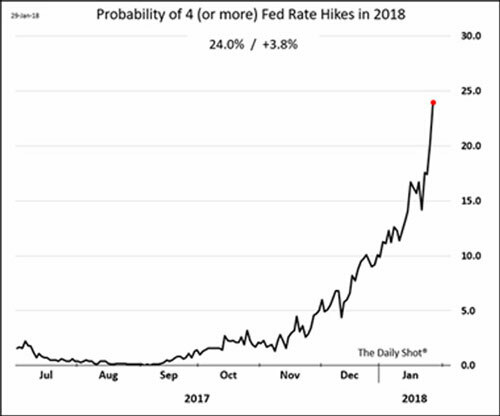 Right now, the market is implying an 84.3% chance that we will have two, three, or four rate hikes in 2018, according to Bloomberg calculations based on Fed Funds futures. That is a high degree of certainty. People are assuming Jay Powell will be the exact same Fed Chair as Janet Yellen. People are assuming the future composition of the Board of Governors will be hawkish. People are assuming the volatility of inflation remains low. People are assuming tax reform will lead to growth. People are assuming the probability of a recession is low. People are assuming the best of Trump. Point is: anything can happen. Powell could rip rates, or the Dow could puke 500 points about a dozen more times, the economic data could roll over, and we could be talking about rate cuts. Twenty years ago, the Fed was a source of volatility. Intermeeting rate moves, 50bp moves all over the place. Now, the Fed is a source of stability. What if stability turns into volatility… monetary policy suddenly becomes unpredictable… forward guidance stops, or becomes faulty? Should the Fed be a source of volatility? In a Fed-free world, there would probably be lots of volatility in the market for short-term interest rates. By suppressing that volatility, is the Fed doing anyone any favors? It’s leading people to believe that the world is less threatening than it actually is. Do you think people can be encouraged to take risks that they otherwise wouldn’t? My personal opinion is that the Fed will hike less than three times (could be zero) and the best-performing asset of 2018 will be short-term bonds. It might be the only performing asset of 2018, because there is no place to hide anywhere else. We saw that on Tuesday—stocks and bonds both down. That is because stocks and bonds are both overpriced, which I’ve said a million times before. The market is nothing if not filled with irony. These days, people aren’t satisfied with anything less than 50,000% on some alt-coin. 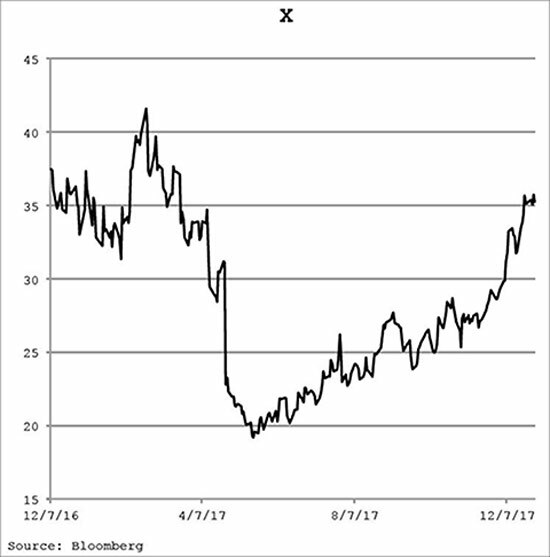 The irony is that a total return of 4% on short-term bonds (2% income, 2% capital gains) might be a home run year in 2018. I don’t think two year notes are on anyone’s list of top picks this year. One more fearless forecast: this might be the first time in maybe forever that we have a bear market, and a recession, without the yield curve inverting. The curve has actually been steepening a bit, which I speculate is mostly due to supply. We run bigger deficits + the Fed chickens out = it is going to be really hard to invert the yield curve. Sometimes bull markets just get old and die. It would probably be a good idea to enter this year with lowered expectations. Sharply. What we had last year was investor Nirvana. If you caught it, good for you. I would not try to repeat the experience this year.